NBC just began airing Season 2 of the show This is Us and it’s reverberating with audiences in a way that few other shows are. Sure, The Crown and The Night Manager won the Golden Globes and Stranger Things ranks as one of the boldest new shows of last season, but This is Us has something that none of the other shows offers, deep personal reflection. Unapologetic reflection on life’s nuances is rarely seen on television and the impact that its having on viewers is vast, passionate and genuine. Characters on the show explore the complexities of love, its strengths and weaknesses, and how single actions can shape someone’s future. 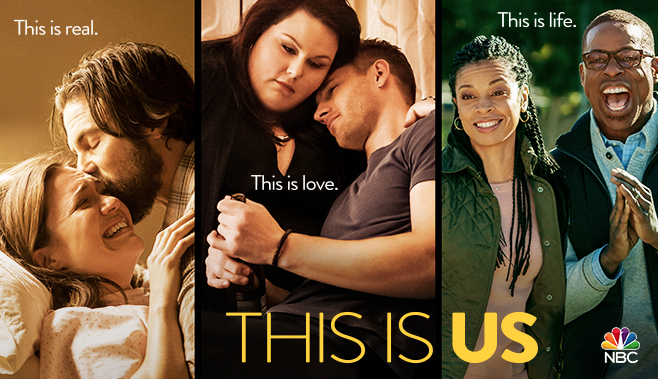 Part of what makes This is Us stand out is the dual storytelling. Part of each episode is told in the past through the eyes of parents Rebecca (Mandy Moore) and Jack (Milo Ventimiglia). They have triplets, (actually a set of twins and a third adopted baby born the same day). Their adopted child is black and his storyline has the most depth and range of issues at this point in the show. The story flips back and forth from the couple in the 70s and 80s, doing the best that they can to raise their family, and the three kids, known as The Big Three, now grown up. This affords the audience the opportunity to directly see the cause and effect of certain actions and comments that the parents made and how it continues to shape them. Parents feel seen, children feel seen, and it emphasizes something that is easier to say than to actually practice, give them a break, they’re doing the best that they can. The show can be lead-footed with manipulative emotion. Some of the writing is cheesy, especially where the son Kevin (Justin Hartley) is concerned. He’s a dim-witted actor who made a fortune on a hit TV show and is now attempting to break into acting on Broadway. His character is likely the least relatable to most as he has lived a particularly selfish and charmed life. The girl of the group, Kate (Chrissy Metz), is obese and this tends to be her main storyline. We see how her Mom’s pressure on her and even living with a thin mother may have impacted her present-day condition. She also struggles to find love, but tries to allow herself the experience with a man named Toby (Chris Sullivan). He is by far my least favorite character on the show. He’s brash and has a base sense of humor which I find completely annoying, but she loves him and is learning what that means. The third child is Randall (Sterling K. Brown). He was adopted on the day of his birth. Early in the show he finds and contacts his biological father. This is the most complex and compelling of the contemporary storylines as the character and world of Randall are quite fleshed out. He is the only sibling married and his wife (Susan Kelechi Watson) is as interesting, intelligent and beautiful as he is. Randall is impecible, determined, endearing and passionate. What keeps me going back to the show is the storyline of Rebecca and Jack. Its where I see myself and my husband and our struggles, failures and joys. Maybe this means that we have an old-fashioned marriage, maybe it’s because this is the only segment of the family who is represented as struggling financially and that survival has been a major and consistent theme in our narrative, but I believe it is mostly because that’s the kind of love that we have. We aren’t perfect for each other, we both fumble and have weaknesses but we have always sacrificed everything to try to share our life together. We have and will continue to do anything and everything that we can to provide for our children and teach them to be on their own while we stand right there in case they need us. It is so refreshing to see a not traditionally successful couple on television. All of this said, if you watch the show for no other reason, watch it because it is what people are talking about right now, and you just might get something out of the experience.